Pannell Discussions » 296 – Endangered species stamps » Ideas in economics, environment, policy and more. « 295 – What is a threatened species worth? Walking past the post office this morning I saw that they are selling a new collection of stamps featuring endangered wildlife. “What a coincidence”, I thought. As a quick follow up to my last Pannell Discussion, I thought I’d share images of the stamps here. 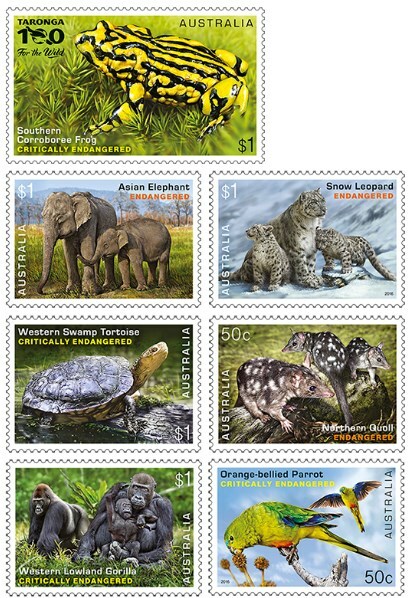 The fact that Australia Post has put these stamps out seems to support my observation that endangered species are one aspect of the environment that connects relatively well with the general public. 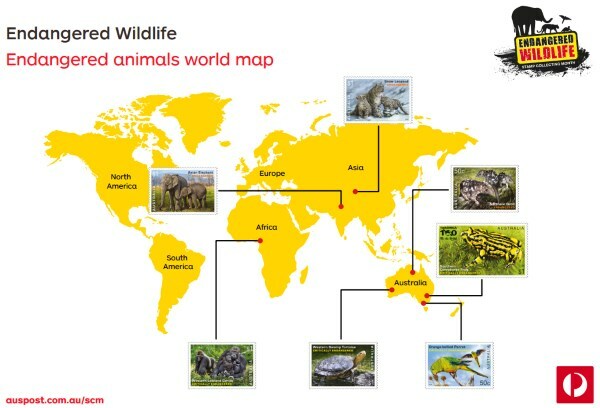 There are seven stamps, including four animals from Australia, two from Asia and one from Africa. Australia Post has done a beautiful job in the design of these stamps. It seems like they’ve also done a good job in providing materials for school teachers to base lessons on these stamps and on the general issues of endangered wildlife. Their web site provides some basic facts and a range of resources that look pretty interesting. The pity, though, is that so few physical letters get posted these days that the impact of a stamp series like this can’t be all that large. I wonder how many people will actually receive one of these stamps in their letterbox. Posted on 27 September, 2016 by David Pannell. This entry was posted in Environment. Don’t know if you realise it, but those lovely endangered species stamps are actually paintings by Perth artist Owen Bell. He’s also a muso who busks around town. the post is very interesting and its seems like this is the best way to remember the endangered species. The post is all about the trend that is been implemented by the people in Australia. I think that this is a very good practice to always remember our endangered species and learn something for our future like for how to protect our species .